I love summer! Especially in Montreal, it's the best time of the year (million times better than our freezing cold winter). I was searching for a sunscreen for summer and I got a sample of Shiseido Ultimate Sun Protection Lotion Broad Spectrum SPF 50 For Face/Body 3.3 oz . When I first applied it on, the white cast really bothered me. However, once it settled into my skin, it was less noticeable. I'm surprised to see that the price went up for this product. It was $19 CAD before and now it's $27 CAD for 1.2 oz. I was lucky enough to buy it right before the price increased. If you buy the smaller size, you actually get slightly more product for the price than the bigger one. 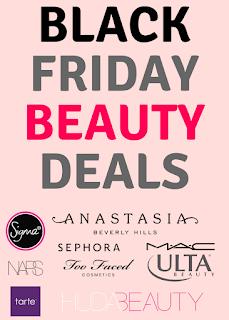 On the other hand, Shiseido Ultimate Sun Protection Lotion Broad Spectrum SPF 50 For Face/Body 3.3 oz is $49 for 3.3 oz, so you get much more for the price and it's for face and body. I got Shiseido Ultimate Sun Protection Cream Broad Spectrum SPF 50 For Face 1.2 oz (the smaller size). I'm surprised to see that the price went up for this product. It was $19 before and now it's $27 for 1.2 oz. I was lucky enough to buy it right before the price increased. *I actually got motivated to do this review after noticing the irritation it had caused on my face. I got a couple of small bumps. You can probably see some in the video. I know I shouldn't have applied on my irritated skin but I actually washed it off after making this video (you can read more about it in the "cons" section below). Offers great protection: Provides both UVA and UVB protection. 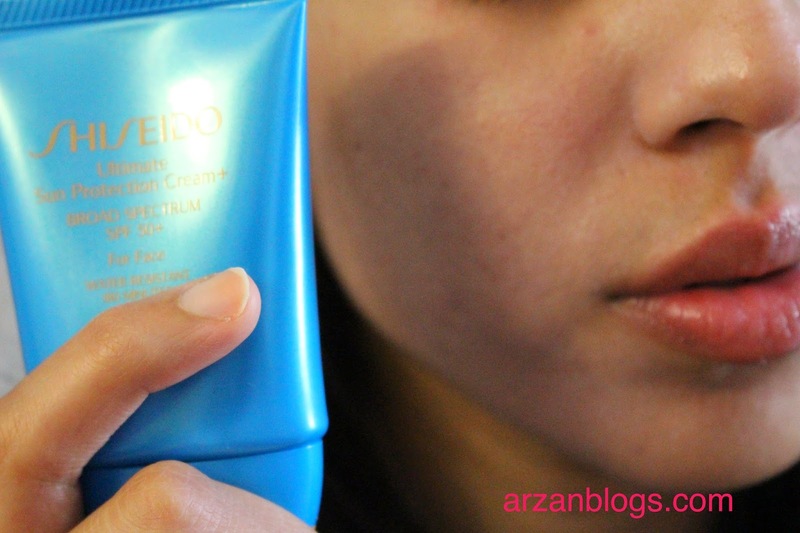 This Shiseido sunscreen is PA+++, which means it provides high level of UVA protection. PA rating system, developed in Japan, is used to determine the level of UVA protection a sunscreen provides. Water Resistant: It is water resistant (80 minutes) meaning that if you are swimming or sweating, the value of SPF will go down after 80 minutes of application of the sunscreen, so it's important reapply sunscreen if you're in the water or sweating after 80 minutes instead of 2 hours. Non-Greasy: I love that it's non-greasy. It doesn't feel like I have something on. 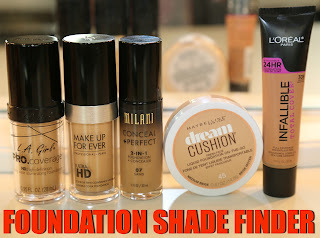 Mattifying: It gives you a matte finish, which many people enjoy especially those with oily skin. Pleasant Smell: It doesn't smell like sunscreen at all. In fact, it has a nice scent to it. Keep in mind that fragrant products do tend to be irritating, so it may not be a good choice for skincare. Slightly covers imperfections: I noticed that it slightly covers redness on my face and minimizes the appearance of my pores. White cast: It does leave a white cast because of its high content of zinc oxide. I have a darker complexion and the white film is definitely noticeable but it's not a deal breaker for me. I noticed throughout the day, it becomes less noticeable. I don't wear makeup on top of it either. However, if it's something that bothers you, then I would suggest you to get a sample first. Hard to blend: It's a thick cream and when you apply it on, it doesn't easily blend into your skin. However, with time it settles into your skin. Drying: I have combination skin and I found it drying, so if you have dry skin then that's something you should keep in mind. I usually apply my moisturizer before and it still dries out my skin. Irritating: This sunscreen has alcohol and fragrance, which may cause irritation to the skin for some people. I have combination skin and I found it very irritating on my skin, so if your skin is sensitive, then I wouldn't suggest you to buy this sunscreen. 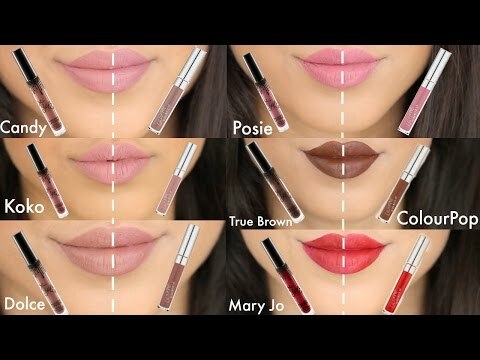 Try to get a sample and test it out on small part of your face. After using this as a daily sunscreen for 3 days in a row, I noticed small little bumps all around my face (mainly on my cheeks), so I stopped using it. The bumps went away after 2 days but I was hesitant to use it again. However, I ended up applying it on another day and washed it off with cleanser after 6 hours just to be on the safe side. I did notice it didn't break me out then. Another time I applied it and left it the whole day and once again my skin seemed fine. I read online reviews and noticed that a couple of people got these bumps. I don't think this sunscreen clogs pores or causes breakouts but instead it's irritating. I noticed if I use it once in awhile, I don't get any breakouts but if I use it for more than 2 days in a row, it irritates my skin and I get the small bumps. I wouldn't use this as a daily sunscreen protection for summer days. I have started using Josie Maran Argan Daily Moisturizer SPF 47 as a daily sunscreen (plus it's a moisturizer, so it's even better). 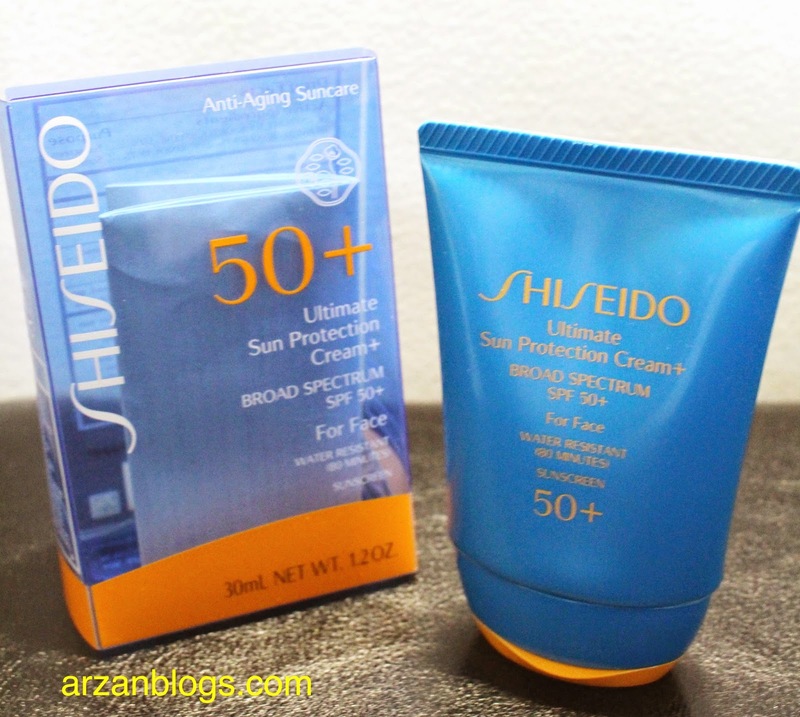 I use Shiseido sunscreen on days when I'm doing outdoor activities especially during the day. I wasn't going to review this sunscreen before but once I noticed the irritation, I knew I had to review it. You can actually see how my skin is irritated in the demo video. However, I wouldn't suggest you to apply it once you do notice any irritation. I washed it off afterwards. Don't rely this as a daily sunscreen but use it on days when you're directly in the sun. If you're mainly indoor, apply a moisturizer with sunscreen instead. If you're in water or sweating, then apply after 80 minutes. Otherwise, apply it every 2 hours if you're directly exposed to the sun. After applying it, wait 15 minutes before applying makeup. By then, it will sunscreen will start settling down into your skin and the white cast will be less apparent. I noticed that throughout the day, the white film is less apparent. Stop using it if you notice any redness or small bumps. Oily skin: If you're looking for a non-greasy sunscreen, then this may be the one for you. It dries out to a matte finish. Sensitive: Even if you get a sample, apply it on a small area of your face (on the side preferably) just to see if you get any reactions. If ever you notice any small bumps or burning sensation, stop using it right away. Dry: This sunscreen can be drying even if you apply moisturizer beforehand. This sunscreen provides great protection but it can be drying and irritating. Regardless of your skin type, try getting a sample of it to see if it irritates your skin. Even if your skin doesn't react negatively, I would recommend using it on days when you're directly exposed to the sun (beach, outdoor activities, etc) because it has irritants (fragrance, alcohol). As for the white cast, well it depends on you. It will be less apparent on lighter skin tones but for people like me who have darker skin, then it is definitely apparent. It does become less apparent with time but if you are directly exposed to sun, it is suggested that you reapply every 2 hours (or 80 minutes if you're in water or sweating) then that's something you should keep in mind. I doubt I will be buy this again. I'm glad I got the small size especially before the price increase. It might be protecting my skin from the sun but it is very irritating. My search for a good sunscreen that's gentle on the skin continues *sigh*.